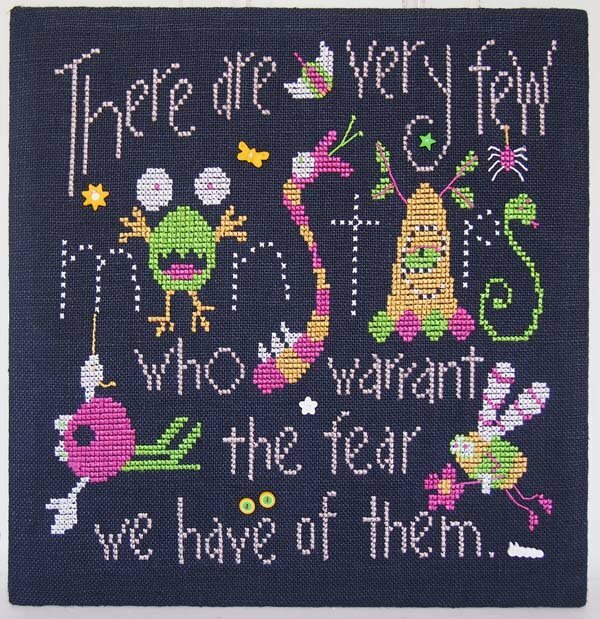 There are very few monsters who warrant the fear we have of them. Written long ago by the French novelist Andre Gide, yet still so appropriate today. Presenting our not-so-scary monsters, stitched over two on Access Commodities 20 count Sea Water Black Legacy Linen (this beautiful linen is actually an uneven weave that is 18 count wide x 16 count tall.) If you substitute an even weave, the completed size will be somewhat smaller. Our model is stitched with 3 strands of Access Commodities Trebizond Twisted Silk on 10 meter spools: 2 spools White TRA 125, 1 spool Burnished Gold Light TRA 231, 2 spools Fuchsia Medium TRA 483, 2 spools Spring Grass Light TRA 713, 2 spools Buckskin TRA 8367. Access Commodities has created a fiber set just for this design that shops may order. SamSarah polymer clay buttons are included with each package and are not available separately. DMC equivalents are give for the silk, but it will not have the same sheen. You can stitch a small swatch to determine the number of strands of cotton to use for the coverage you wish. Finishing instructions are included to mount this to an Ackfeld 12" x 14" table stand HERE.